I love speaking about improving healthcare with information technology, and am a frequently invited lecturer both nationally and internationally. In fact, I’ve delivered more than 150 invited lectures around the world on medical informatics topics such as healthcare data standards, large-scale data aggregation, health information exchange, electronic health records, and most especially LOINC. If you would like to invite me to make a presentation to your group, please contact me. Your presentation and our conversations were immensely interesting. I have heard nothing but wonderful things about you; people are so appreciative of your perspective. Such an enthusiast, bright, and energetic young man who is clearly a rising star in the field of medical informatics. The physical therapist students and faculty were really excited by your presentation. You met all of my goals…thank you for doing such an outstanding job. What a great presentation! I know that all in attendance walked away with a renewed excitement over the integration of technology into healthcare. An Introduction to LOINC: the global vocabulary for tests, measurements, and observations in healthcare (ONC LOINC 101). 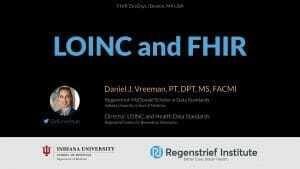 Presented by Daniel J. Vreeman, PT, DPT, MS, FACMI on 2019 04 17. 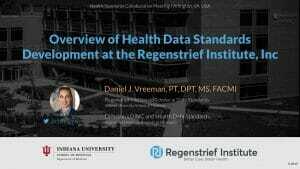 An overview of health data standards development at the Regenstrief Institute, Inc. Presented by Daniel J. Vreeman, PT, DPT, MS at the Health Standards Collaborative Meeting | Arlington, VA USA on 2019 03 07. Summary of how LOINC advances interoperability of social and behavioral determinants of health data. Presented by Daniel J. Vreeman, PT, DPT, MS at the CDC EHR Forum on 2019 01 07. An Introduction to LOINC and its Use Around the World Today: The global vocabulary for identifying health measurements, observations, and documents. Presented by Daniel J. Vreeman, PT, DPT, MS at the Fundació TIC Salut Social Workshop: Laboratory data - how are they shared at SISCAT? on 2018 11 29. The LOINC/RSNA Radiology Playbook: A unified terminology for radiology procedures. 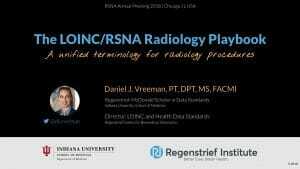 Presented by Daniel J. Vreeman, PT, DPT, MS at the RSNA 2018 Scientific Assembly and Annual Meeting on 2018 11 27. An Introduction to LOINC: the global vocabulary for tests, measurements, and observations in healthcare (MedInfo Version). 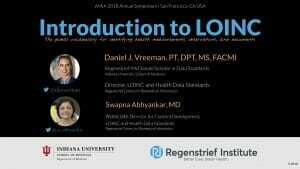 Presented by Daniel J. Vreeman, PT, DPT, MS, FACMI and Swapna Abhyankar, MD at the AMIA 2018 Annual Symposium on 2018 11 03. How using health information technology might save lives but steal your sunshine. Class lecture by Daniel J. Vreeman, PT, DPT, MS, FACMI. 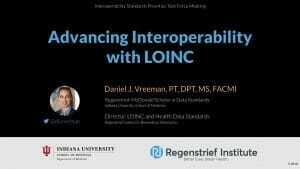 Summary of how LOINC advances interoperability and recommendations for setting priorities on interoperability. Presented by Daniel J. Vreeman, PT, DPT, MS at the HITAC Interoperability Standards Priorities Task Force meeting on 2018 09 25. 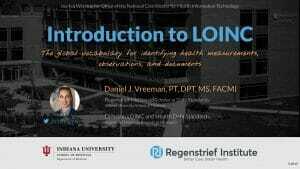 Presented by Daniel J. Vreeman, PT, DPT, MS, FACMI to the LOINC community on 2018 08 20. FHIR and LOINC: they go together like chips and salsa. Presented by Daniel J. Vreeman, PT, DPT, MS at the FHIR DevDays conference on 2018 06 19.